Upgrading and retrofitting the existing setup can help extend its lifespan, especially if you are afraid that you can’t afford an overhaul for the entire system. Here are some of the factors that can influence your decision to integrate variable speed HVAC systems into your commercial building. Even if your current HVAC system is running smoothly, you should always be prepared for the next problem that could knock it out of commission. Upgrading and retrofitting the existing setup can help extend its lifespan, especially if you are afraid that you can’t afford an overhaul for the entire system. Here are some of the factors that can influence your decision to integrate variable speed HVAC systems into your commercial building. Saving energy also helps save money. When your HVAC system is more efficient, you can lower your energy bills and distribute cooler air throughout the building more quickly and effectively. This benefit is because instead of running at full blast (while on) or at full stop (when it’s off), heating and cooling can meet the needs and expectations of the users – so one floor of your building won’t be freezing while other occupants are sweating profusely. That improvement also means that the HVAC system can speed up or slow down depending on how populated the building is or what settings are needed depending on the weather outside – and it makes a noticeable difference. If the fans on your current system are letting you down, then it could be a sign that some maintenance or upgrades are needed. One solution to this problem is to retrofit the system that is already there. Retrofitting the system return and supply fans help resolve this issue. You’re probably wondering how this happens. The variable frequency drives (VFDs) inside the associated HVAC systems adjust the speed of the fan according to demand. More air is pushed through the ductwork of the system. 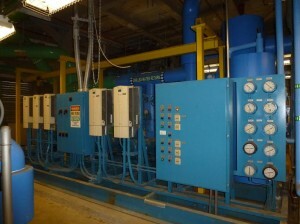 Next, turn your attention to the fixed capacity compressors. Although you might not know how to diagnose any problems with the compressors or carry out those repairs, you can rely on expert technicians such as those at Crockett Facilities to help you with any preventative maintenance that becomes necessary. Using a VFD will boost the overall performance of all of your commercial HVAC systems, especially if your building is large enough to accommodate multiple systems or your campus features buildings with independent heating and cooling. This entry was posted on Friday, March 15th, 2019	at 12:02 pm	and is filed under Commercial HVAC Systems and VFDS . You can follow any responses to this entry through the RSS 2.0 feed. Both comments and pings are currently closed.